New Year begins on the cusp between February and March. Our year as herbalists is defined by the life cycles of the plants and we make medicine following their rhythms of the running of sap, the leafing out, the blooming and fruiting and the dying back. We gather the medicinal part of the plant at the time when the medicinal part is most alive and most vibrant, when the metabolic energy of the plant is concentrated in that part. From November to early February the plants slumber. The trees, shrubs and vines have dropped their leaves, annual plants have died and most perennial plants have died back to the ground with all life concentrated in the roots that lie beneath the frozen ground. We herbalists rest during this time as well, making due with the herbs we have dried during the last season and the tinctures we have made, hoping they will last us until the day we can gather some more. At some point in late winter, when the days become longer and our planet spins closer to the sun the daily temperatures warm up into the 40s or 50s but the nights returning to freezing temperatures in the 20s. Sap flow is triggered by thawing days and freezing nights. This is the time that we take stock of our inventory, put on our winter boots and tramp to the forest to gather medicinal barks. The tree looks barren; there are no buds or leaves or flowers but beneath the outer bark there is great activity; the sap is running and the inner bark is alive with this activity. There are many medicinal trees and shrubs. In the upper Midwest, where I live, we may gather the barks of Sumac, Oak, American High Bush Cranberry, Prickly Ash, Trembling Aspen, among others. You will want to make sure you know this is the genus or species of tree you want to harvest. It can be hard to identify some trees without their leaves,fruits or nuts. We snip a small low hanging branch with our pruning shears, never causing harm to the mature tree by removing large chunks of bark from the large trunk and absolutely avoiding girding the tree, which is the practice of removing the bark around the circumference of the trunk. This practice results in ultimate death for the tree. It’s nice to find a small, young tree where you can reach the branches. If the tree is in your yard or on the edges of your yard maybe you can use a ladder. Not all medicinal barks are gathered in the spring. There are a few exceptions. Wild Cherry Bark is a notable exception, a bark that is harvested in mid-summer. Wild Cherry Bark is chemically more mellow in the midsummer when the cyanide like glycoside levels have decreased. White Pine is another exception. Some preparations with pine are made from needles or from sap, as well as the bark. The bark is harvested in the midsummer. There’s no simple rule for learning the exceptions. You simply have to become intimate with the materia medica. By early April the sap is done running but most trees have not leafed out yet and the energy of most herbaceous plants is still locked away in the roots. Sometimes during this time you stumble upon a nice patch of Chickweed looking all lush and juicy during this time. Go ahead! If it looks ready, it is regardless of what the calendar says. 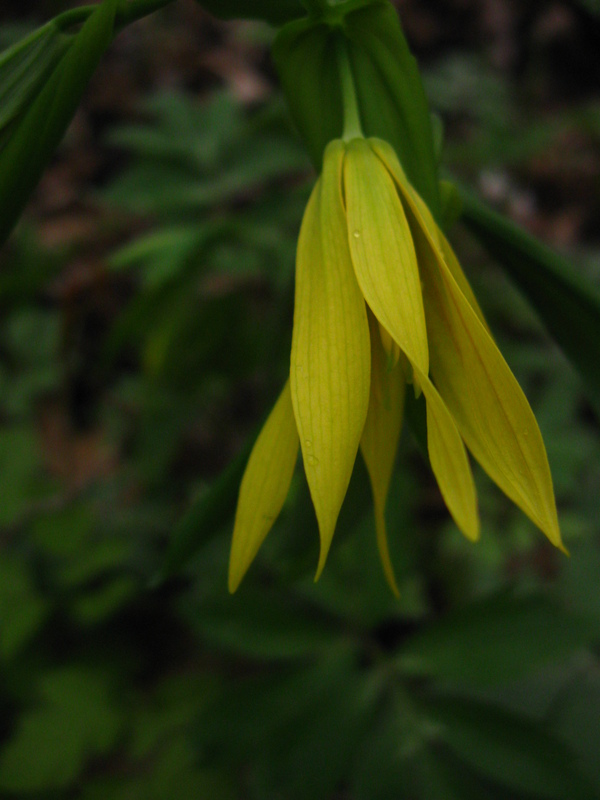 Take some time in late April and early May to visit the forests and look at the spring ephemerals. These gorgeous wildflower carpet the forest floor taking their chance to bloom before the trees leaf out casting deep shade. You might see Bloodroot, Trillium, Bellewort, Spring Beauty, Wood Anemone, Blue Cohosh, Wild Ginger, Trout Lily, Hepatic and others. This is a magical time to be in the forest. Some of the spring ephemerals are valuable medicinal plants, however the part used is most often the root. Make note of the height of the plants and carefully study their leaves. Perhaps you can come back to harvest some Wild Ginger or Bloodroot or Blue Cohosh in the late summer. Be aware that these plants tend to die back to the earth before the other perennials. 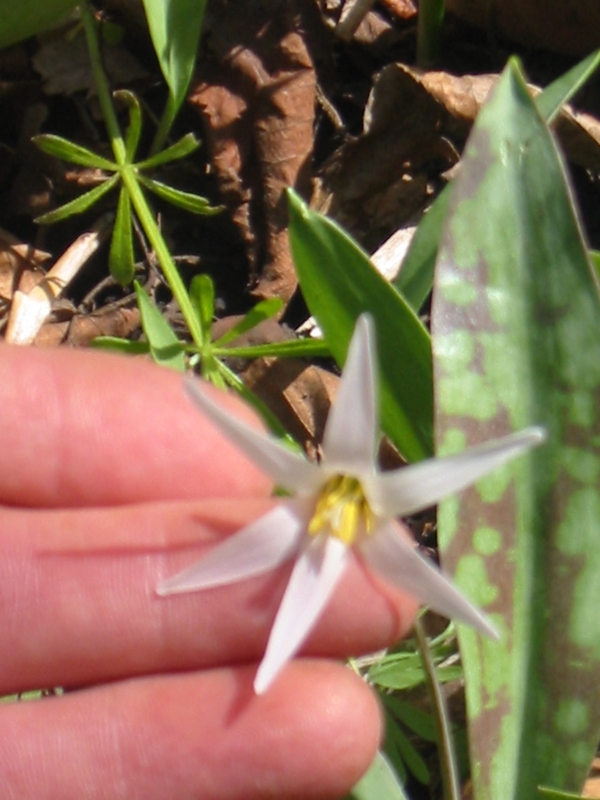 Also be aware that some of the spring ephemerals are very uncommon and deserve our respect. These plants live in the deep woods. They do not appreciate the disturbances of humans like Burdock, Dandelion, Goldenrod and the other common plants that coexist so comfortably with us. Only harvest the deep woods plants where they are abundant and harvest small amounts. Use small amounts in your herbal practice. Tiny doses work when well chosen! Consider cultivating some woodland plants is your yard or land allows. Some of these plants particularly Wild Ginger do well when cultivated. By mid May the land is flush with plant life. All of our favorite weeds are waking up. Shepherd’s Purse, Motherwort, Comfrey Leaf, Nettle, Violet, Chickweed, Cleavers, Horsetail, Mullein and many more. If the medicinal part is the leaf now is the time to harvest. You want to harvest the leaf (or leaf and stem) while all of the plants’ energy is in put into leafing out, before flowering, fruiting and seed production. Take for example two common herbs: Motherwort and Nettle. The early spring growth is deep green, large leaves, lush and vibrant. As the plant grows throughout the summer the leaves up the stalk become smaller, sometimes they become a bit withered, bug-eaten, the depth of green fades they give off a distinct impression of being less vibrant. Look at the flower. Motherwort and Nettle don’t have big showy blooms, nevertheless, this is where the plant’s energy is-blooming. The flowers look great! Some plants have to be harvested in the mid -Spring, like Cleavers and Shepherd’s Purse. These plants have a very short season. Get them now; if you come back in early July you won’t find any evidence they were there. Most medicinal plants where the desired part is the flower bloom during the summer months of June and July. Each plant is different and you have to watch them carefully, making note of when the plant is likely to bloom. Sometimes the herbalist has just a brief opportunity to harvest blossoms, like Linden Blossoms who give us just a couple of weeks of beautiful, fragrant blooms before they become dried up. Goldenrod is another example. It seems as though you simply blink and the bloom is over. Other plants, especially garden herbs like Chamomile, Calendula and Lavender blooms for weeks and even a few months allowing the herbalist to harvest at a relaxed pace. Pick the beautiful blooms or buds that are just beginning to unfurl. Avoid the ratty blooms that are on their way to seeding. Some plants like Calendula will re-bloom over and over if you treat your flower harvesting like deadheading in your garden; pinch the stem off where it joins the stalk to produce more busy growth and flowering. But bear in mind if you intend to harvest berries you can’t take all the blossoms. This is particularly true for shrubs like Elderberry. If you harvest from just one shrub be careful to leave enough umbels to become berries for your medicine needs and for the birds to nibble on. After the flowers come the fruits. Most fruiting bodies are so small we don’t even notice them; the plant appears to us to go from flowering to seed. Some plants however, produce fruits we recognize are berries or other types of fruits. There aren’t too many medicinal fruits. Some of the most common include Hawthorn Berries (actually haws, but we usually call them berries), Rosehips, Elderberries, Sumac Berries, Juniper Berries and Prickly Ash fruits. You need to learn each berry species separately. Some like Rosehips, Hawthorn fruits and Sumac berries stay on the plant for weeks and weeks offering the wildcrafter a lot of flexibility. But Elderberries have a shorter season and you may face stiff competition with the local birds! Gathering berries in the heat of the summer is a wonderful experience, you can gather so many so quickly and it feels like the quintessential harvesting experience. The end of summer and early fall brings a return to leaves. So many perennials in both the garden and the wild and weedy world put forth a perfusion of gorgeous new leaves after they go to seed. This is also an interesting time to be out among the plants. Sometimes you have a flush of growth at the base and then a tall dried out stalk with seeds growing out of it all. You can visualize the different stages of the plants life during one moment in time. This is especially true of mints like Motherwort, Lemon Balm, Catnip and Wood Betony and also true of some of the rose family plants like Agrimony and Lady’s Mantle others. As fall comes along plants die back to the ground all of the life-force of the plant is concentrated in the root where the plant has stored food enough to last it through the long dark winter. If the stalk is sturdy and still standing you can harvest roots as long as the ground is not frozen and you can get your shovel in. This includes those sturdy plants like Yellow Dock, Burdock, Rattlesnake Master, Baptisia Dandelion Root and so. Other plants die completely back to ground earlier in the season or the dead stalk easily seperates from the root making it harder for beginners to feel confident that what they dug up is what they are looking for. This is true for plants like True and False Solomon’s Seal, Blue Cohosh, Bloodroot and other spring ephermerals. In that case seek those plants out earlier in the year. When we’ve dug our last root we rest. The practice of wildcrating is a slow one but an infinitely rewarding one. Mother Nature will always have her say. You have time wildcraft on Saturday, you go out in search of the Elderblossoms and they aren’t in bloom yet. You will have to visit again. You go to that mucky spot where you found all the Blue Vervain a few years ago and there’s none to be seen–the whole place is covered with cup plant. Wildcrafting is not a practice of acquisition. Many students I meet are so enthusiastic about their newfound plant i.d. and medicine making skills they are in a big rush to acquire all the plants they desire for their medicine kit. Slow down. Relax. You have the rest of your life to gather plants. Take time to watch plants through many seasons. Watch them and study them as they emerge from the earth in the spring, watch them bloom, seed or fruit and die back. The will enrich your experience with the plants and build confidence in your skills of identification. If you can put aside acquisition and embrace knowing the plants you will know them so intimately, by the time you harvest you will have no doubt. You can always, buy, barter or trade for a plant you can’t find or aren’t sure about. You won’t get to everything most seasons. I never do. Cultivate your connections with other herbal enthusiasts in your community and you can get the tinctures you need. What’s Doin’ the Bloomin’? by Clayton and Michele Oslund (organized by bloom time, lots of photos. I love this book). Peterson Field Guides Eastern/Central Medicinal Plants by Steven Foster and James A. Duke (you should own it. Learn your plant i.d. from a person, use Peterson’s as a back-up. I like the one with line drawings. The herbal information is very conservative).